This species is accepted, and its native range is Borneo (Sarawak, Kalimantan). Rather local in 1st and 2nd Divisions; once recorded for the Ulu Rejang. Elsewhere in W Kalimantan. Endemic to Borneo. Solitary or clustering, moderate rattan climbing to 15 m, but usually much shorter; stem without sheaths to 8 mm diam., with sheaths to 18 mm diam., internodes c. 15 cm long. Sheaths bright green with sparse to rather dense scattered black triangular spines 7-15 mm long and abundant deciduous red-brown indumentum; knee present; ocrea not developed. Flagellum absent. Leaf cirrate, 1.2 - 2 m or more long, including the cirrus to 1.2 m; petiole 10-25 cm, sometimes much shorter, armed with rather coarse black-tipped spines; leaflets 6-8 on each side of the rachis, very distant and slightly to distinctly irregular, usually rather stiff, plicate, tending to diverge from the rachis at an acute angle, sometimes the basalmost reflexed, the longest to 35 x 2 cm, very sparsely spiny along the margins, transverse veinlets distinct. Inflorescences considerably shorter than the leaves, c. 40 - 50 cm long, but occasionally to 1 m, the male more highly branched than the female; prophyll and primary bracts short, spiny or not along the margins, often with abundant reddish-brown indumentum; partial inflorescences 3-8; male rachillae usually curved, c. 10 -15 mm long, the female fewer in number, to 25 mm long. Mature fruit ovoid to c. 15 x 10 mm with a distinct beak and covered in 15 vertical rows of cinnamon-brown scales. Seed ellipsoid c. 8x6x5 mm, endosperm deeply ruminate. Seedling leaf not known (Fig. 46). Habit - Climbing; stems clustering; not branching in the forest canopy; not dying after flowering. Plants dioecious. 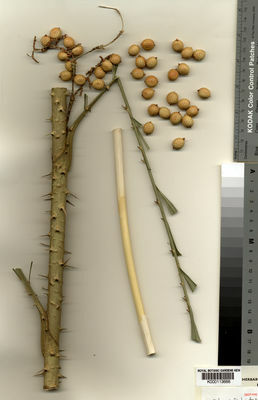 Leaf-sheath - Tubular for most of its length; stem and sheath together 1.35-1.65 cm; flagellum absent; knee present; with fewer spines than the rest of the sheath. Sheath surface lacking small horizontal ridges; without hairs or minute spines; green; with scales on surface; brown. Leaf sheath with sparse spines, or with abundant spines; spines persistent; horizontally pointing; of more or less the same size; the larger spines laminar; the longest, excluding those at the mouth of the sheath less than 1cm. Spines straight; in life same colour as the leaf sheath; with whole surface covered in fluffy indumentum; the bases downswept and crescent-like. Spines mostly not grouped. Spines around the leaf sheath mouth scarcely different from those on the rest of the sheath. Ocrea - Present; not diverging at an angle from the stem; tattering; unarmed. Leaf-stalk - Absent or usually less than 3 cm. Leaves - Cirrate; rachis armed; not hairy. Undersurface of newly emerged leaflets same as upper surface. Scales absent from leaflet surfaces. Leaflets sessile; 11 to 39 on each side of rachis; irregularly spaced and parallel; held in a single plane; linear-lanceolate; the leaflet tip acute. Longest leaflet 27.9-34.1 cm; 2 to 5cm wide; with none or very few brsitles; the margins with bristles at tip only. Short, dark or dark-tipped up to 5mm long. Leaflets scarcely plicate; the veins not radiating; midrib not raised and prominent. Lowermost leaflets not reflexed across the stem. Apical leaflets not or scarcely joined; not less than 4 cm long. Inflorescence - Inflorescence axis erect along the axis, with clawed spines on the primary bracts; not rooting at its tip; much shorter than the leaves; the first bract not enclosing the inflorescences at anthesis. Partial inflorescence present; bracts at the base of the partial inflorescences wholly tubular with the mouth lacerating into many fibres around the base of the partial inflorescence. Rachilla lacking an enclosing bract; not at all pressed against the subtending bract. Flowers arranged in two rows. Female rachillae not congested; without conspicuously stalked flower cups. Bracts on the rachillae not net-like. Fruit - At maturity 1-1.4 cm; globose; red resin (Dragon's blood) absent; one seeded. Calyx in fruit split part way and partly tubular. Fruit scales with a conspicuous central groove; the tips not recurved; colour on ripe fruit greenish; when dry greenish-white (excluding dark margins). Seed globose; the surface pitted. A rare rattan of lowland forest in Eastern Kalimantan distinguishable by its fimbriate bracts in the inflorescence. The cane appears to be of excellent quality but the stems are rarely very long.